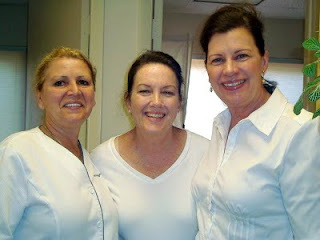 -The nice folks at Dove offered Holly, of Tropic of Mom, a PitiCure (an underarm exfoliation treatment) & a pedicure. Holly was nice enough to extend the offer to me. I met up with Holly and 5 other gals at Kaffee’s Garden Spa for a blissfully, relaxing time. The ladies at Kaffee’s Garden Spa could not have been nicer. They made us feel like movie stars and pampered us to the max. Here are some of the ladies at Kaffee’s Garden Spa that will make your experience just as astonishing. For those of you that need reminding, this is what indulgence looks like. Dove had us try their deodorant called Dove Ultimate Beauty Care. The Dove Ultimate Care line comes in four different scents Sheer Silk, Light Radiance, Smooth Cashmere, and Original Clean. I used Sheer Silk. To give the deodorant the "real" test, I put it on before I tackled an outdoor painting project in the South Florida scorching 93° heat. (Check in tomorrow for the details on that project.) The Dove Ultimate Care Deodorant felt silky and smooth to put on and by the end of my project, I didn’t smell like a man!!! It kept my underarms sweat and odor free. Click here to save $1.50 on your Ultimate Beauty Care product. Speaking of Dove, I can't wait to show you my latest painting project using a technique with Dove Beauty Bar! How fun! I haven't been to a spa in two years~I think I need to. I can't wait to see what kind of painting you do with a bar of soap! Check out those toes!!! Amazing. Love the flower. And me too -- I want to see how you paint with a Dove beauty bar! Awesome. What a fun day! I'm super jealous. Your toes turned out super cute!